This tutorial covers some basics for using Bryce 4's fractal terrains, including how to use the tile feature and how to work around the tiling gap bug. Generating fractals can take some time, especially at high resolutions. So, when you want to browse through the various fractals, do it at a grid size of 128. You can check out up to 8 different fractals generated at a 128 grid size in the amount of time it takes to generate a single 1024 grid fractal. The time to worry about increasing the grid size is after you've found the fractal you want to use. After you make sure your grid size is set at 128, the next thing to do is pop up the fractal menu and pick a fractal other than 'Bryce Classic.' The 'Bryce Classic' fractal terrain does not use the randoms and it does not tile. Selecting a new fractal algorithm will activate the randomizers and all three will be on. They are: Random Extent, Random Position and Random Character. By turning these randoms off one at a time and generating several fractals before turning the next one off, you can zero in on a terrain you really like. To get the most out of this, it helps to know what the different Random options are all about. Note: Although 'Extent' is in the menu before 'Position,' and 'Extent' is usually the first one I turn off when I'm shopping for fractals, I'm going to explain 'Position' first because I think the concepts make more sense in this order. Imagine that each fractal algorithm exists as an infinite sheet and terrains are squares cut from that sheet. Position affects what part of the fractal the terrain comes from. While some fractals are very similar throughout, others are vastly different depending on where you are on the sheet. These three are from the same fractal pattern with only the Position randomizer turned on. The three terrains all have features that are about the same size. This controls the size of the squares. Another way to think of it is as controlling the size of the features on each terrain tile. It's feature size I look for first when I'm generating fractals. Many of the terrains generated don't have enough detail and others have too much! Once I find one that is just right, I turn off Random Extent and then look around for different positions. These three are from the same fractal pattern with only the Extent randomizer turned on. The third one is zoomed in on the lower left corner of the first, and the middle one is nearly the same as the first, zoomed in only slightly. Some fractal algorithms have more character than others. I usually leave the Character random for last. These three are from the same fractal pattern with only the Character randomizer turned on. This particular fractal has a moderate range of characters. Some have very strong characters and can look completely different, others don't change much at all. Once you have a terrain you like and the last 'random' has been turned off, now is the time to bump up the grid size to at least 512. Generate the high-res terrain and exit the terrain editor. Tiling terrains isn't something that you do after you've been working on a complex scene for days. Setting up a grid of tiled terrains is the first thing to be done for a new scene. After the grid is established, then you look around the grid looking for interesting scenes. Start with a new scene file. Create a terrain object. Do not resize the terrain object! Go into the terrain editor and shop for fractals as described above. When you have exited the terrain editor after generating a high-res terrain, duplicate it (command/control D) and switch to top view (the keyboard shortcut for top view is simply a 2). Use the arrow keys to nudge the terrain. It does not matter which arrow key you use, as long as you remember which one you used. To move the duplicate completely off to the side of the original, it will take 16 arrow key presses (or 8 shift-arrows). 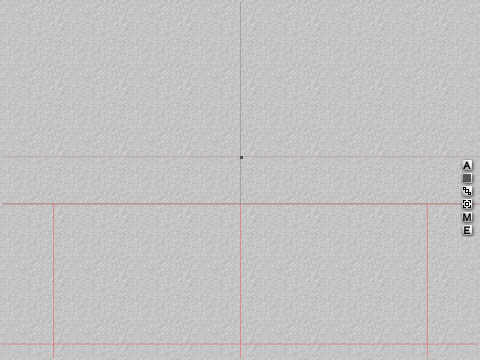 Note that when you are in top view, the direction an object moves when you nudge it with the arrow keys is the direction it moves on the screen. These directions also correspond with the common map directions. To put the proper section of the fractal onto the duplicate terrain, go into the terrain editor and select one of the tile options based on the arrow key used to nudge the duplicate. That is, if the up arrow key was used to move the duplicate, turn on the 'Tile North' menu option. Once you've selected the direction to tile, double-check that all the randoms are off. They all should already be off if you followed the shopping procedure above. Click the fractal button to generate and exit the terrain editor. Now you'll want to repeat the process of duplicating the terrain, nudging it with the arrow keys and going back into the terrain editor to generate the next tile. Note that you can tile terrains in a variety of patterns. The only important thing is that you remember which arrow key you used to nudge the duplicate and make sure the tiling direction matches. Two example tiling patterns. Others are possible. The right-hand one can be continued in an ever-expanding spiral. Terrain tiling is something that has to be done all at once. There's no way to go back later and add new tiles onto a block of tiled terrains. Once you've used the terrain editor for anything else other than making your tiles, it "forgets" the fractal you're working with. Earlier, we imagined that the fractal algorithm was an infinite sheet and terrains are squares cut out of that sheet. That's not quite how it works. The squares get cut out OK, but then they are applied to terrain objects which are slightly bigger than the squares. The method below will enable you to see that difference between the square and the terrain object. Once you've laid out your tiles, select all the terrains and group them. Then, type about three asterisks, ***. With each asterisk you type, the group of terrains will double in size. 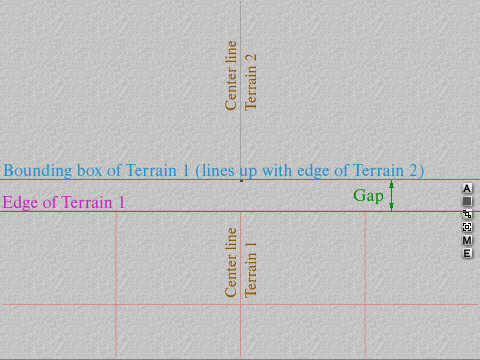 After the terrain group is expanded, click the arrow to bring the group to ground level and then ungroup it. Not only have the terrains increased greatly in size, but so have the gaps between them, and now they're big enough so that you can do something about them. Like the tiling itself, the gap fixing can be done in any order as long as it is consistant. I like to start with the first two terrains created, but any two adjacent terrains can be selected. Work in top view. Use the plus key, +, to zoom in. 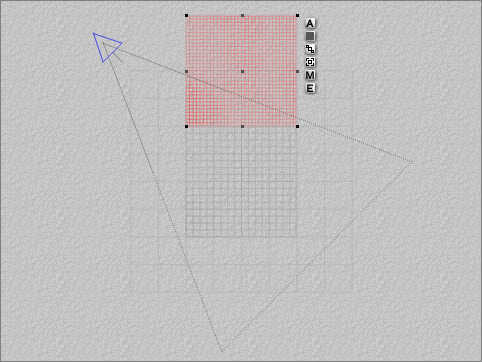 By using the keyboard zoom, the wireframe display will zoom in to the center of the selected object(s). And, since we have two adjacent terrains selected, this will give you a close-up on the center of the gap between the two. Hit that plus key until it doesn't zoom any more (or as long as you can still see the gap, depending on how many asterisks you typed when enlarging the group). Note how you can not only see the gap between the terrains, but you can also see how the bounding box of the selected terrain does not correspond with the edge of the terrain object. This is why the gaps are there! De-select one of the terrains and drag the other terrain so their edges line up. You'll also have the center line of each terrain showing to help in lining them up. While the second terrain is still selected, add the third terrain to the selection by holding the shift key and popping up the 'select terrains' menu. Unless you renamed every terrain as it was duplicated in the tiling process, the menu should list each terrain numbered in the order it was created. Selecting terrains 2 and 3 will select adjacent terrains. You want to do this via the menus instead of zooming out and here's why - once you've selected the next pair of terrains, typing the plus key will simply shift the top view to focus on their gap. That's one keystroke, versus a bunch of -'s to zoom out enough to see the next terrain to select, followed by a bunch of +'s to zoom in. Here's the same scene as the previous screenshot, zoomed in one more time and with the gap between the two terrains closed up. You can see the bounding box of the selected terrain overlapping the edge of the other terrain, but the two actual terrain edges are now lined up. Repeat the process by de-selecting terrain 2 and dragging terrain 3 into place. You may want to lock the terrains as each one's position is fine tuned. Or, if you want to doubly insure your gap-fixing, after you've adjusted all the terrains, group them and hit the slash key, /, once. This will cut the size of the group in half (and will halve the size of any remaining gap!). This island is a set of 12 tiled terrains (which were all made solid and set to boolean positive) grouped with a 13th large terrain set to boolean intersect.